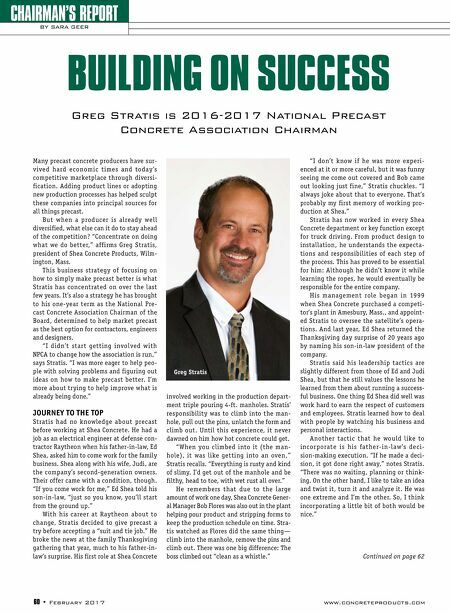 www.concreteproducts.com February 2017 • 61 CHAIRMAN'S REPORT GREG STRATIS, NPCA Family owned and operated since 1949, Shea Concrete is one of New England's largest suppliers of precast concrete products. 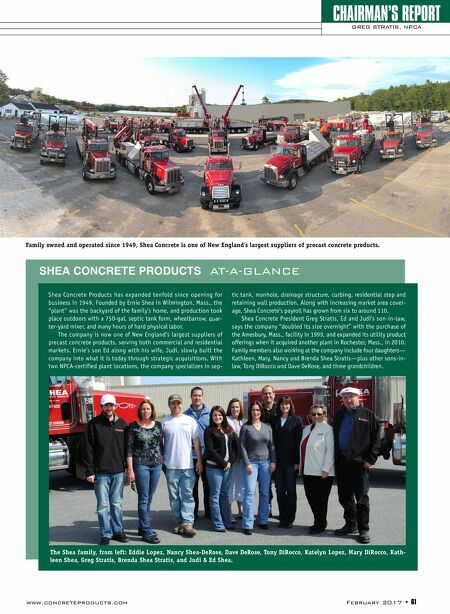 SHEA CONCRETE PRODUCTS AT-A-GLANCE Shea Concrete Products has expanded tenfold since opening for business in 1949. Founded by Ernie Shea in Wilmington, Mass., the "plant" was the backyard of the family's home, and production took place outdoors with a 750-gal. septic tank form, wheelbarrow, quar- ter-yard mixer, and many hours of hard physical labor. The company is now one of New England's largest suppliers of precast concrete products, serving both commercial and residential markets. Ernie's son Ed along with his wife, Judi, slowly built the company into what it is today through strategic acquisitions. With two NPCA-certified plant locations, the company specializes in sep- tic tank, manhole, drainage structure, curbing, residential step and retaining wall production. Along with increasing market area cover- age, Shea Concrete's payroll has grown from six to around 110. Shea Concrete President Greg Stratis, Ed and Judi's son-in-law, says the company "doubled its size overnight" with the purchase of the Amesbury, Mass., facility in 1999, and expanded its utility product offerings when it acquired another plant in Rochester, Mass., in 2010. Family members also working at the company include four daughters— Kathleen, Mary, Nancy and Brenda Shea Stratis—plus other sons-in- law, Tony DiRocco and Dave DeRose, and three grandchildren. The Shea family, from left: Eddie Lopez, Nancy Shea-DeRose, Dave DeRose, Tony DiRocco, Katelyn Lopez, Mary DiRocco, Kath- leen Shea, Greg Stratis, Brenda Shea Stratis, and Judi & Ed Shea.